Boat loads of halibut, salmon and sablefish. The steamers New England, Kingfisher, Manhattan and schooners Knickerbocker, Prospector and Tyee coming and going. Trolling boats, tenders, seiners and gill-netters tied to the wharf. Floating traps, fish pirates, overdue and lost vessels, shipwrecks, cannery fires and dock accidentsthese were everyday happenings at the New England Fish Company plant in Ketchikan. And the manager of the plant dealt with them all. The manager loved his job for its challenge and diversity. In the beginning, though, the position was difficult and daunting. Especially for a man with a wife and two little girls who'd spent their entire lives on the East Coast. The man had been a Gloucester cod fisherman in earlier years and in 1903 started to work for the New England Fish Company (NEFCO) in Boston, where he lived with his young family. After a few years, NEFCO officials decided to transfer the man out west. This was in 1910 when halibut catches on the Atlantic Coast were dwindling and the company searching for a new source of supply. 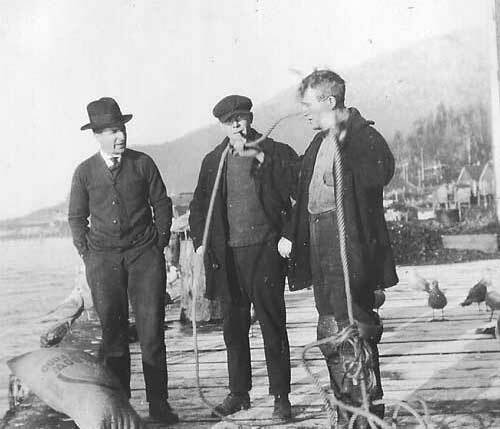 The company sent Harry C. Nunan first to Vancouver, BC, at that time a primitive Canadian town, to establish a fish plant. From there they transferred him to Prince Rupert, BC, an even more isolated place. From Prince Rupert he was transferred to Ketchikan where the company had built a cold storage plant-in the middle of the wilderness south of the town limits. When Nunan arrived he found there was no road to connect the plant with the town. A trail wound through the woods, providing the only access (other than by boat). Skinny trees, stumps, mud holes and wooden boards and planks surrounded the plant. There was no housing, electricity or telephone. There WAS a cold storage plant, however, a few fishing boats and a wharf and commissary under construction. 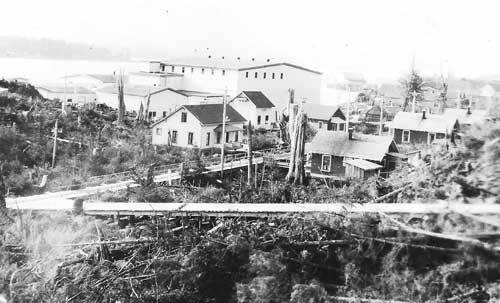 Before building the plant, NEFCO officials had checked out the town of Ketchikan, noting its excellent harbor and port location; its proximity to Prince Rupert (and the predicted Grand Trunk Pacific Railway connection); and its hordes of fish schooling in clean cold waters. When the plant was completed it represented a company milestone: a foothold on American soil, something the company had wanted and needed since its foray to the Pacific Coast, and ownership of the second cold storage plant to be built in all of Alaska (the first at Taku Harbor). For nearly 20 years the plant remained the largest in the territory. From the beginning plant manager Harry Nunan worked hard and did everything, unloading fish, loading ice, selling bait, hiring personnel, manning the marine radio, supervising construction. There was so much fish coming into the plant, Nunan made plans to add freezing capacity to the cold storage and to build a one-line cannery. He accomplished both in 1923. NEFCO now could handle all forms of fish-fresh, frozen, mild-cured and canned-as well as provide ice, bait and other supplies to fishermen. Nunan hired a young man named Emery Tobin (who later became publisher of The Alaska Sportsman Magazine) to work as the company bookkeeper. 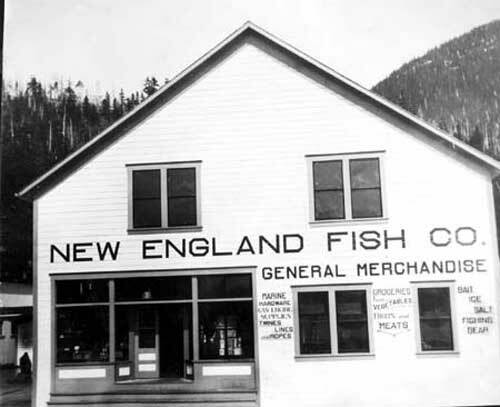 "Mr. Nunan is a 'live wire' in the fish business," Tobin wrote in 1920. "He is an A #1 business man with progressive ideas." By 1925 NEFCO needed a larger source of electrical power and Nunan arranged to build a concrete dam and hydroelectric plant at Herring Cove, twelve miles south of town. When completed in 1926 the hydro facility provided the company with its own private source of power. In 1927 Nunan took on the challenge of building a new two-line cannery. When it was finished, he turned the former cannery building into a warehouse for canned fish. New England Fish could now boast the largest fish-freezing plant on the Pacific Coast and an up-to-date, high-speed cannery that ran one half-pound line and two one-pound lines. Upon arriving at Ketchikan one of the first things Nunan did was build a house and send for his family, wife Jennie and daughters Ruth and Dorothy. They all loved Alaska, especially in the summer when the cannery bustled with fish and boats and activity. Jennie worked in the company office, while the girls, especially Ruth, flirted with fishermen, cannery workers and other available young men! The entire family joined the Order of Masons and Harry and Jennie both held offices as "Worthy Patron" and "Worthy Matron" respectively. Ruth and Dorothy became "Rainbow Girls." During the early 1920s Harry Nunan took business trips to Seattle, where he joined the local Rotary Club. It didn't take him long to determine that Ketchikan needed a club too. In 1925 he organized Rotary 2000 - recognized at the time as the first Rotary Club in Alaska - and became its first president. He also joined the Elks Club, and he and his family became active in many community projects. But in 1933 Jennie fell ill and was forced to move to a sanitarium in Arizona. She later moved to Seattle, where she died in 1940. The girls grew up and Ruth married and moved to San Francisco. Dorothy took a job as a secretary to G. W. Skinner, owner of big Seattle fish interests. After Jennie's death Nunan remained in Ketchikan. He hired a young divorced woman named Mary Brown to work as a stenographer at the plant. Mary was 24 years younger than Nunan, pretty, full of fun and had a little daughter named Isabel. Harry Nunan soon fell in love and he and Mary decided to marry. Nunan began training his assistant manager, J. K. "Jack" Johnson, to take over management of the plant. In 1944, he was able to retire from NEFCO after 40 years with the company. He and wife Mary said their goodbyes to Ketchikan and moved to Washington State, where Nunan had invested in property. He and Mary spent four happy years, traveling around and visiting his properties. He died in 1948 in Everett, Washington. Mary Nunan survived him by 40 years. 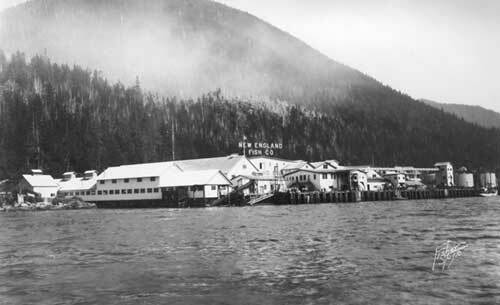 The New England Fish Company plant at Ketchikan caught fire in 1965. The newspaper described it as the single most devastating fire in the town's history, causing a million dollars of damage. The cannery burned to the ground and was not rebuilt. 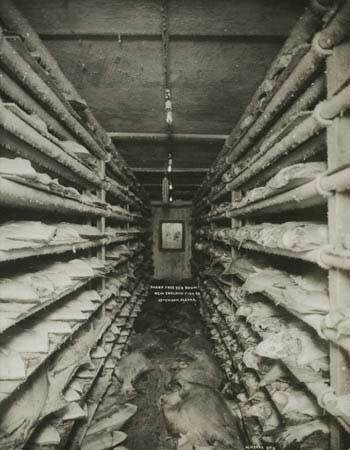 The cold storage, however, was salvaged and continued to operate for several more years. Ketchikan Alaska Chronicle, Ketchikan, AK: Feb. 19, 1923 and Mar. 16, 1923. Ketchikan Daily News, Ketchikan, AK: Dec. 6, 1948. Roppel, Patricia. Southeast Alaska, A Pictorial History, The Donning Company, Norfolk, VA 23502. Tobin, Emery. Letters to his mother and other correspondence, Ketchikan, AK: 1920.